Over the years, we’ve received many requests for recipes. Our award-winning kitchen wins over the hearts (and taste buds) of guests and leaves them wanting to re-create meals for their own loved ones. We’ve decided to start featuring our talented Chefs and one of their favourite recipes each month, getting them to cut back measurements and amounts from feeding 900 to feeding your family. This month, we’re featuring our Executive Sous Chef, Guadalupe Muñoz de Ratcliffe. As an experienced convention centre Chef, Lupe is inherently a skilled planner. “It’s all about prep work. As long as we can prep ahead of time, everything will run smoothly”. Our kitchen is also very skilled at working under stressful situations with little to no prep time. Most recently, several events were relocated to our venue with just hours notice. Lupe and our culinary team came together to pull off back to back events, as well as prepared batter for a pancake breakfast that fed over 5,000 people with under 12 hours notice. 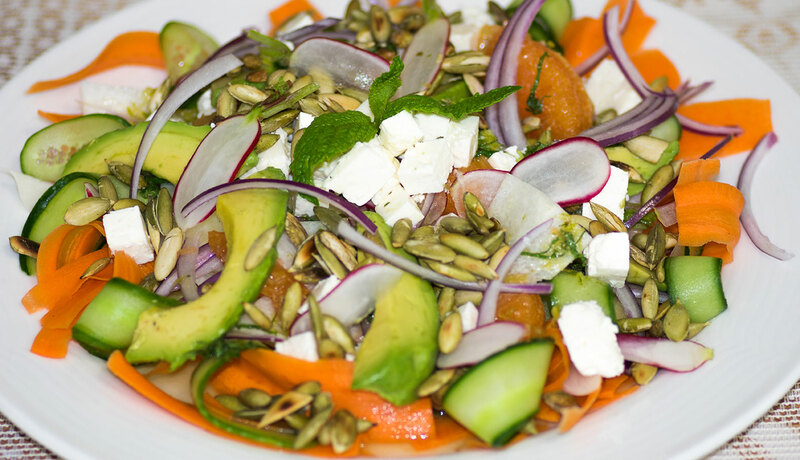 We’re happy to share Lupe’s recipe for a light, fresh salad entitled “Just for Summer”. It’s a perfect side dish for grilled salmon; light, flavourful and, cooling. Lupe only buys local farm fresh ingredients. She hasn’t set foot in a grocery store for years! All of the ingredients in this salad can be found at your local farmers market. We hope you enjoy it! * Jicama is the crisp, white-fleshed, edible tuber of a Central American climbing plant of the pea family (Pachyrhizus erosus, family Leguminosae), cultivated since pre-Columbian times and used especially in Mexican cooking. Make a bed with the carrot and cucumber ribbons. Place the other ingredients on top of bed of carrot and cucumber. Mix dressing with whisk or fork.